I’m absolutely terrible at remembering to buy matching thread to go along with all my fabric, and I’d probably end up with six spools of the same color even if I did remember. So more often than not, rather than dragging the kids down to the local Joann’s, I find myself trying to just fudge it with what I’ve already got on my thread rack. 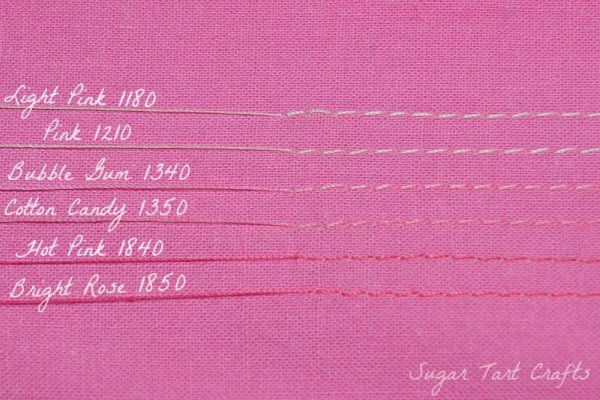 This tip comes in pretty handy for almost every sewing project I do. The lines above were sewn with the six closest shades of pink I had from the Coats & Clark XP color chart. Bubble Gum and Cotton Candy are what I would normally choose as the best matches, but if they happen to be unavailable you can see how the darker Hot Pink and Bright Rose blend in much better than the Pink and Light Pink colors. In real life those two look way too dark on the spool, but the stitches don’t lie. There’s probably some scientific optical illusion explanation, but I surely don’t know what it is. The darker colors just work. The toughest choices for me though usually involve patterned fabrics. With all those gorgeous colors sometimes it is fun to choose the most contrasting “Pop” color (like this green on blue, or this pink on green), but if you are going for a true match your best option is usually to stick with the background color. 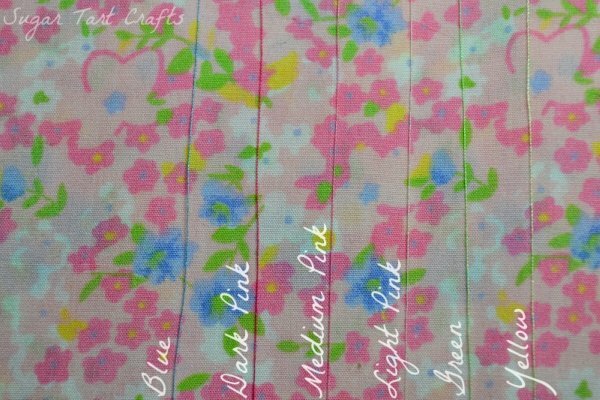 With this floral print the light pink blends in the most over the longest length so that’s the one I’d use.What’s the most prominent color on your thread rack? That shade you always have a match for. I’ve somehow managed to stash fourteen spools of blue, and only one sad little orange! WOW! What a great post! Thank you! This is quite the stickler for seamstress' sometimes. I am just the opposite as I will buy thread just thinking I may need it! Don't even have a project in mind? Well, better get some of this tie dye thread cuz ya never know now do ya? I wouldn't have thot to pull a thread from the fabric to match the spool, Genious! !